We were tight for offices and space here and the booths have worked out well for us. Interview rooms should be quiet and insulated so you’re not disturbed and you don’t disturb anyone else if things would get loud. The booths filled that need. We are using two VocalBooths at Cumru Township Police as interview rooms and for conducting Voice Stress analysis examinations. Voice Stress analysis is a type of truth verification process similar to a polygraph examination. However, voice stress analysis utilizes computer technology to identify deception through uncontrollable vocal changes in a person, as opposed to physiological changes which are measured by the polygraph. (explanation in a nutshell) Voice Stress testing needs to be conducted free of ambient noise, so the booth is perfect for this process. •We have outfitted both booths with 2 video cameras, one is covert and has been placed inside a faux thermostat, the other camera is very conspicuous, located in the corner of the ceiling. • A covert microphone for audio recording is also installed in each booth. 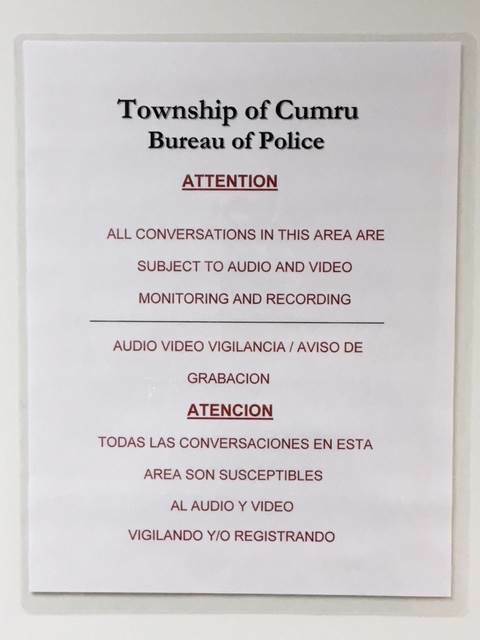 • A sign is placed on the door and the interior wall of the booth; providing notification the activity within the booth will be audio/video recorded. • The floor of the booth has been covered with plastic, utilizing desk chair mats cut and sized for flooring. This is done to protect the flooring and carpet longevity. • Small desks and chairs conducive for police interviews of Victims, Witnesses, and Suspects. • The smaller booth is utilized to conduct the Voice Stress examinations. • A red light was installed on the outside of the booths and illuminates when the audio/video recording system is activated. - Det. Sgt. George G. Kuriger Jr.